When registering or interacting on our site, as appropriate, you may be asked to enter your name, e-mail address, mailing address or phone number–either directly or indirectly via social media logins. You may, however, visit our site anonymously. To send periodic emails - The email address you provide will be used to send you periodic updates regarding Kingston&Co Condominiums. 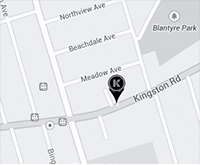 When you register for Kingston&Co Condominiums, you Opt-In to our email list. Note: If at any time you would like to unsubscribe from receiving future emails, we include detailed unsubscribe instructions and link at the bottom of each email.